Palaestina with Part of Syria. 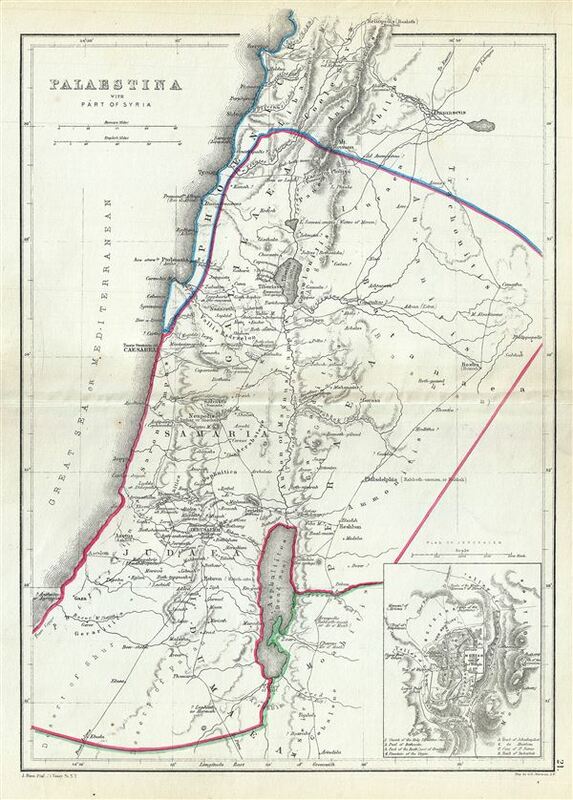 A scarce 1867 William Hughes Map of Palestine, Israel or the Holy Land in antiquity. Centered on the Jordan River, the map covers the regions between modern day Israel and Lebanon along with parts of Jordan and Syria. An inset in the lower right quadrant features the plan of Ancient Jerusalem. It depicts the ancient walled city in detail, noting many ancient sites, including the Fountain of the Virgin, the hill of Evil Counsel (the legendary house of Caiaphas, where Judas is said to have plotted the betrayal of Jesus), Temple of the Kings, the Tower of Psephinus, the site of the Temple in Moriah, the Pool of Siloam and others. A key in the bottom of the inset map identifies more ancient sites. The map uses both contemporary and ancient place names throughout. The ancient Phoenician cities of Sidon and Tyros (both among the earliest, wealthiest and most enterprising ancient cities) are noted. This map was created by William Hughes, printed by J. Bien and engraved by G.E. Sherman, for issued as plate 21 in Sheldon and Company's An Atlas of Classical Geography.